Dog toys can be pretty expensive to replace sometime, and they’re far from indestructible (I think George’s record was 5 minutes before ripping the head off). George LOVES soft toys, he loves any material in his mouth, for him, there’s nothing better than tugging, flinging and ripping a toy. 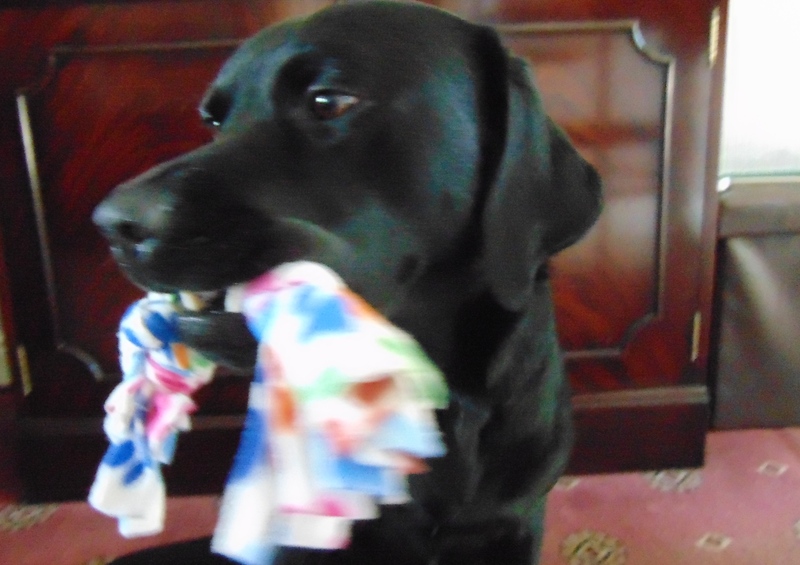 However, soft toys last minutes, and rope toys make him cough, and end up all over the floor! So with that in mind, I made this tuggy toy for him. I’m pretty proud of myself 🙂 See what George thinks about it at the end. Cut fleece into 9 strips or more if you want it thicker. These strips are 20 inches long and 1 to 2 inches wide. Use sharp scissors or you create wonky lines like below (It’s a dog toy so it doesn’t matter). 2. Tie a knot in the top. Divide in to 3 lots of 3 and start to plait, make sure its tight. 4. Tie the bottom knot. Make sure its tight! Leave some tassely ends to play with. And you’re done, it’s play time! Here’s how much George loved it.